Show Us Your Team & You Could Win a $500 PRIZE PACK!!! BASTAR performance makeup is designed to stand out and stay on! Here is your chance to win some for FREE! 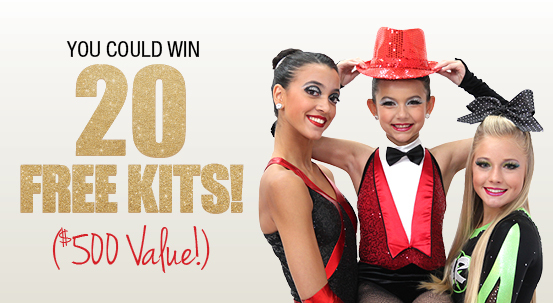 Contest winner will receive 20 CUSTOM MAKEUP KITS to share with her team! You must ATTACH A PHOTO on the Facebook post to be entered to win. See post for more details and contest rules. Good Luck! Dancers: Competition & Recital Season is Here! Dance Makeup Kits are a Must for Competition. If the Makeup doesn’t match or doesn’t show well with the costumes you may get a deduction or not score as high as you should on style points. Don’t let that happen! You work too hard!Dance is about technique and performance. So if you want to be a Winner – plan your Makeup the way you plan your costumes! Don’t skimp Winning Dance Studios watch all of the details and don’t leave out the Dance Makeup Kits. This year Make a Change. If you have only recommended Makeup for your Dancers. Try making the change and posting Makeup Kits online. Why? Print or Create a Face Chart – Step by Step How To. Demonstrate: Apply the Makeup to a Dancer Do One Side Of Her Face! Pass Out the Makeup Kits. Almost universally Dance Studio Owners who have made the switch to online Studio Makeup report that the parents are happier & the process is less stressful than when they recommended makeup from the drugstore. Drugstore is not for Dancers. Drug Store Makeup does not Stay On & Stand Out under bright lights. The pigments in Drug Store Makeup are not strong enough to look dramatic from the judges or theater seats. And it does not look the same on every girl no matter her skin tone. A #1 Priority for BA STAR! Makeup Kits provide a level of confidence that the Studio has the professional business strategy that the parents can support. The first year – you may have parents who stick to the old ways – but as the program grows – the Makeup Kit participation will expand. For the parents, Its Easy, Affordable & the Dancers Look Great! All this with very little work for the Teachers or Studio Owners. No Whining or Complaining. It’s a Win! Win! Do You Do Makeup Kits for Recital? Recital is a very important part of the economic health of any Dance Studio. And, recital parents want to know that their child’s hard work and performance is being respected & celebrated. Its not just about competition. Recital parents pay for tuition, costume and shoes – why not give them the opportunity to include Makeup Kits? Recital Makeup are priced as low as $10.75 (2 pc Eye & Lip Kit) On Stage the effect is Dazzling. The pictures are prettier, the Dancers are more confident, the Parents are Happier. Whether you have created Dance Makeup Kits for Competition or Recital it is very important to teach “ How to Put the Makeup On” This is especially true if you have elaborate production numbers or costume changes. Teaching the art of makeup is like teaching the art of dance.It takes technique and practice. Start with a Dance Makeup Class prior to Dress Rehearsal. I like to print a face chart - use the Makeup Kit that most closely matches your Studio Makeup or make your own face chart. Then have a Makeup leader select a girl and do one side of her face the way you would like to see the Makeup on stage. Pass out the Makeup Kits. Have the girls sit in front of the mirrors and do one side of their faces. Have the Makeup Leader – check the makeup and make corrections. Then have the girls do the other side of their face incorporating the changes. This small lesson and support will make it easier at recital or competition to have flawless Stage Makeup. Spring is So Busy! Don’t Stress! We are here to Help! We are proud of all of your hard work and dedication! Get Ready, It's Almost S-P-R-I-N-G! It’s Almost Spring! An Amazing time of Year! Exciting for Cheerleaders with Competition & Try Out Season! And, for Every Season it’s important to have your Custom Makeup Kits ready to Wow the Judges. For Cheerleaders it is the start of Nationals & Try Outs! There is still time – but hurry, matching Cheer Makeup helps score Style Points! And, with all the top Cheer Teams competing for the title – every point counts. 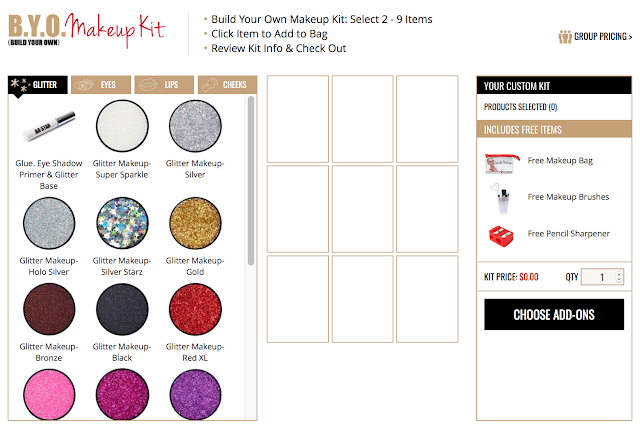 You can create a New Makeup Kit by using the online Custom Makeup Kit Builder – a life saver for busy coaches and teachers. You can create your Makeup Kit at midnight & it ships the next morning! And, speaking of shipping you can expedite – for when you really need it in a hurry, or use the Free Shipping Option for Orders over $55.00. At Competition Season every minute counts & we are here to help! If you have the time for individual parent orders – we can post your Makeup Kit online. Again, its Super Easy with Super Quick Shipping. Just let us know what you want in your Makeup Kit and we will take care of the rest. Post under your team or studio name and email you a link to send to your parents. No more running around to try to find the right shade – just order from your phone. Have Your Cheer Makeup Kit but Need a Refresh? Holding Try Outs & Getting Ready for Next Cheer Season? Watch for Pre Season Specials & Beauty Bucks! Whether your Cheering on the Field, Marching in a Parade or Competing in All Stars - Nothing, Says Success more than a Great Look & a Big Smile! BASTAR performance makeup is designed to stand out and stay on! Here is your chance to win some for FREE! Contest winner will receive 20 CUSTOM MAKEUP KITS to share with her team! You must COMMENT on the Facebook post and TAG A FRIEND to be entered to win. If you win your friend will also win $50 Beauty Bucks! See post for more details and contest rules. Good Luck! When fall football season comes to a close, the spirit-filled pageantry of cheering and dancing during games is replaced by the rigors of competition. If you’re a cheer coach hoping to vault your squad into championship contention, there are countless minute details that need to be taken into consideration. At national events, judges meticulously critique every facet of a team’s performance—including the uniformity of a squad’s appearance. To put your best foot forward, it’s vital for you and your team to look the part. One way to differentiate yourself from the field is to add a pinch of glitter to your squad’s matching makeup kits. Read on to discover the benefits of using glitter to accent your current cosmetic routine as well as how to apply loose glitter eyeshadow. There are a multitude of ways in which glitter can enhance the flare of your squad’s performance and ease the overall preparation process. Perhaps the most obvious improvement glitter can provide is in a dancer’s appearance. By experimenting with bold combinations of eyeshadow and glitter, you can make dark, smoky eyes sparkle and pop. You can choose from either matte or glitter shadows to achieve your desired effect. Another clear benefit of BA Star’s ultra-fine glitter makeup is that its tiny granules are ideal for adhering to the smaller eyelids of junior and mini performers. It can be difficult for a makeup artist, mom or teacher to keep a young dancer from fidgeting and rubbing off her glitter in the process. Thankfully, our glitter makeup was thoughtfully designed with this in mind and will cling closely to a performer’s skin throughout the duration of a routine. When performing intricate choreography with a ramped up level of intensity, it’s vital that your makeup won’t run or smear when exposed to sweat. No matter how rigorous the routine, our glitter makeup is resistant to the unsightly effects of perspiration and will keep you looking fresh for the scorer’s table. Glitter is a safe, polyester material which can be gently applied to the skin without fear of irritation. Even dancers and cheerleaders with sensitive skin can add a gleaming dash of glitter—it’s non-reactive, gluten free and won’t lead to pesky, inflammatory breakouts. BA Star’s ultra-fine glitter makeup is made up of safe, shiny granules that won’t hurt your eyes if it’s errantly applied. 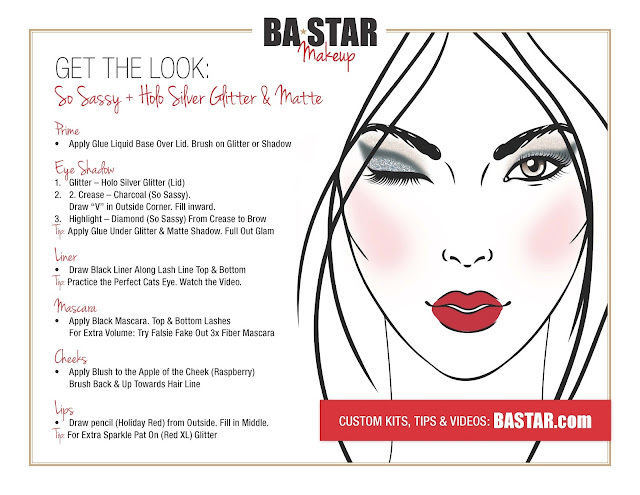 We’ve designed our glitter so it can be quickly applied moments before a performance, and our guide to applying BA Star’s ultra-fine glitter makeup can be found below. In order to achieve quick results with BA Star’s glitter, we’ve condensed our recommended makeup application process to three simple steps. 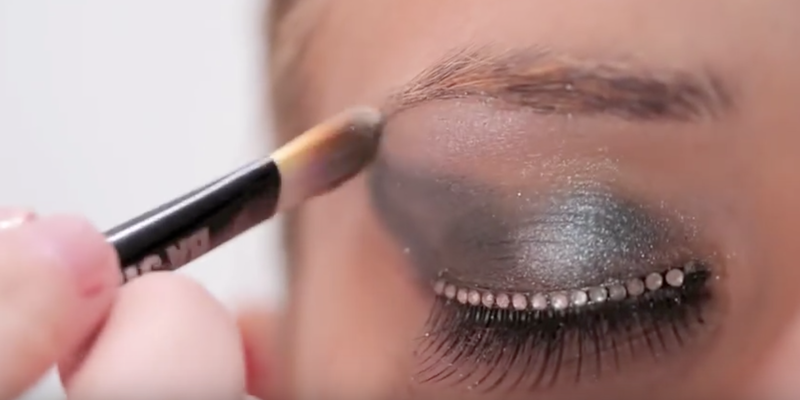 Start With a Glitter Glue Base: Thoroughly cover the surface of the eye lid with a Glitter Glue Base. The included wand will allow you to achieve a thick, even coating of this liquid adhesive. Our Glitter Glue ensures that glitter will remain on the skin throughout the duration of the competition. Brush Off: Use a Blush or Powder Brush (the bigger, the better) to gently brush away any glitter that may have fallen off the lid onto the cheek. Remember, the Glitter will only stay where you apply a base (glue, lip pencil or shadow palette). Glitter will not stick to or stain uniforms or costumes – so don’t be afraid to brush that glitter away! Try applying So Sassy Eye Duo Palette alongside our Holo Silver Glitter Eye Makeup to achieve a beautiful, steel color. You can see an example of this show-stopping look on our dance and cheer models or by checking out our step-by-step face chart below. Don’t be afraid to experiment! By adding glitter to your lips as well as your eyes, you can double the sparkle and visual impact of your cosmetics. Draw on Lip Pencil: Start from the outside of the lip and draw inward. Pat on Glitter: Start on the inside and move outward towards the edge of your lips. TIPS: Adding a little glitter to a lipstick will make the lipstick more vibrant. It dries down the lipstick so that you can change costumes without fear of leaving a lipstick stain. Best of all, glitter not only adds sparkle but keeps the lipstick on after snack time between performances or awards. NOTE: Do not use lip gloss as this will make your lipstick run. 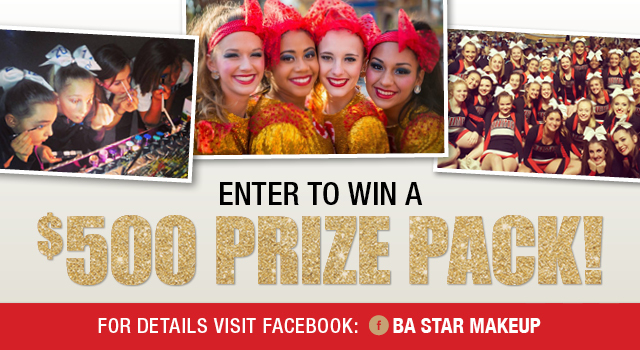 If you’re looking to gain pizazz and a few trophies this year, ensure that your squad or studio has a winning appearance by wearing cheerleading competition makeup from BA Star. In our inventory, you’ll find a variety of gleaming glitters to choose from. Submit a free sample request to begin experimenting with different looks today! CONTEST ALERT: Win A $500 Prize Pack!!! BASTAR performance makeup is designed to stand out and stay on! Here is your chance to win some for FREE! Contest winner will receive 20 CUSTOM MAKEUP KITS to share with her team! You must like the Facebook post to be entered to win. See post for more details and contest rules. Good Luck! It's Competition Season! 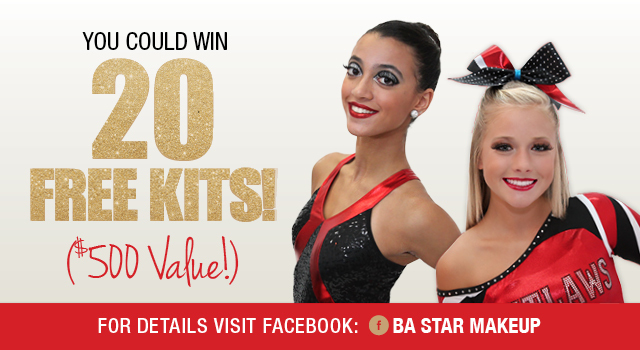 Winning Cheerleaders & Dancers LOVE Easy-to-Use Glitter & Matte Makeup Kits! Now is the time to Order yours! Builds Confidence! Look & Feel Like Winners! Convenient! Order as a Group or Parents order Individually. Parents Love Them! Super Affordable, Convenient, Easy to Use! Why Should We Buy Matching Makeup for Our Cheerleaders & Dancers? Why cant everyone get their own? All of the Competitors and Performers are wearing the same uniform or costume. It's unprofessional to take the stage or competition floor with makeup that doesn't match each other or the Cheer uniforms or Dance costumes. Style Points can be deducted from the overall score. Our Team has Cheerleaders and Dancers with different Skin Tones. Should they buy Makeup that matches their Skin tones? No, While this is a big concern for both Coaches and Parents. The performers and athletes need to show a cohesive professional look. Performance Makeup has heavier pigments designed to Stand Out, Stay On, And Look the Same on every Cheerleader, Dancer, Gymnast, Drill Team, or Performer taking the stage. The best way to see the effects is to try the colors on different members of your team. Performance or Competition Makeup is not sold in Drugstores. Performance Makeup is specially formulated for Cheerleaders and Dancers, Athletes & Competitors who Perform and Compete under the Bright Lights on the Field or at Big Events. BA STAR specializes in Performance Makeup for Cheer & Dance creating Makeup Kits for Cheerleaders and Dancers for over 10 Years! BA STAR Performance Makeup is meant to Stand Out yet is Gentle enough for the youngest competitor. All of the ingredients are listed on the ingredient tab of each product & it's Gluten Free! Why Buy the Makeup Kits? Convenience & Affordability! No more searching after work or trying to get something at the last moment. Makeup Kits – are the easiest, most convenient way to insure that every Cheerleader, Dancer has everything they need for Competition. Makeup Kits are easy-to-use! Complete Makeup Kits are Pre Packed with FREE Cosmetic Bags, Brushes & Pencil Sharpener. New to Cheer or Dance Makeup? Try Before You Buy! Order FREE Samples HERE. Learn How to Apply with FREE Facecharts! Browse New Looks! There's Still Time! How to Apply Winning Dance & Cheer Makeup!